I’m skipping ahead a bit in order to get caught up a little quicker ^^; My new netbook died at the hands of the zilla last week and I have been unwilling to go back to using the desktop (mostly due to addiction to certain iPad games) so I have not been keeping up with things here so my apologies for that. I did make a nifty little visual list of all the anime character Dollfie Dreams last week right before the netbook died (I was partially through the Volks’s character list when the netbook got smashed). 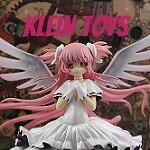 Nanoha arrived last Tuesday, she didn’t come until very late in the day so I didn’t photograph her until Wednesday. I wasn’t really supposed to get Nanoha at all, I am supposed to be on a dolly diet after having purchased both the Nia and Mikuru Dollfie Dreams in the past month. 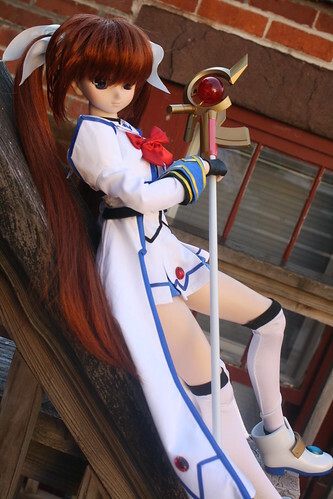 Nanoha popped at a really reasonable price and my birthday is at the end of next month so she is counting as an early birthday gift and I am still very much on my dolly diet. I remember when she was still available from Volks themselves, I had her in my cart and she was almost all the way through the checkout process when I changed my mind at the last second. It wasn’t that I didn’t want her it was that the timing would have been most unwise for my bank account. I have been regretting the decision to not get her ever since. 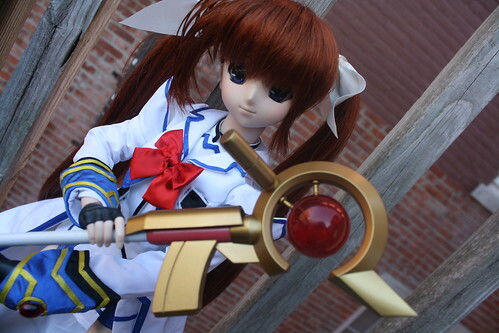 Nanoha is my nineteenth Dollfie Dream. Her stock is fairly elaborate, I was actually really impressed by it. She actually comes with two sets of hands and feet; her shoes are actually built in the primary set of feet and she comes with a spare set of normal feet and then she comes with a set of gloved and normal hands. She comes with her staff but you are provided with the parts to build your choice of three different tops to it, I chose the more rounded of the three but I may switch it out later on. 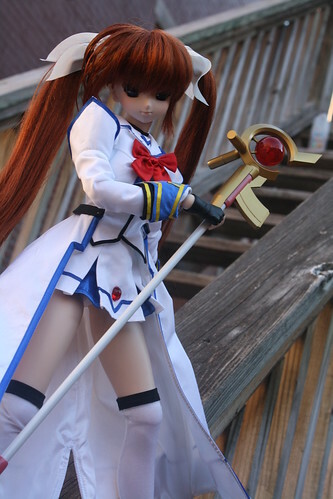 I actually don’t have a ton of Nanoha merchandise just the LE figma of Nanoha, a Fate figure and a few of the mega-sized Gift plushes. 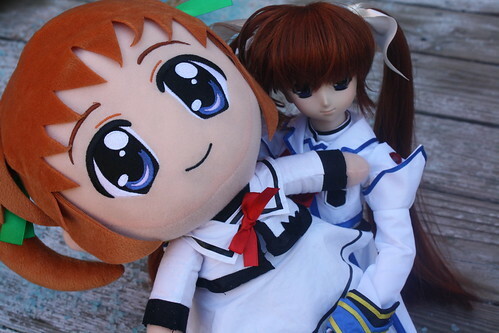 Speaking of the Gift plushes they are huge compared to the Nanoha DD. I tried to avoid getting too caught up with the merchandise because there is just so much of it, I wouldn’t mind getting the nendoroids of Nanoha and Fate eventually though. 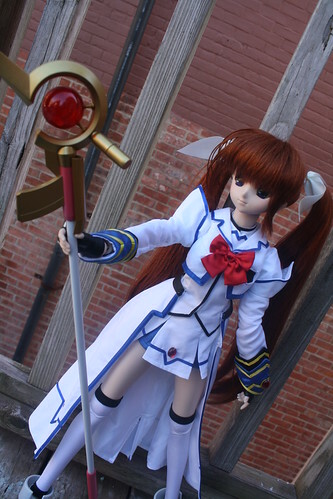 This entry was posted in 2011- 365 Toy Project, Doll, Dollfie Dream and tagged Dollfie Dream, magical girl lyrical nanoha strikers, nanoha, volks. Bookmark the permalink.